TW Wongamat Beach Resort. 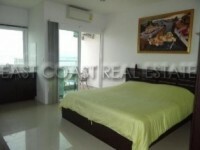 This modern studio unit is located on the 17th floor of a new building on the Wongamat Beach area. It has been tastefully finished and consists of 50 sq.m. and has fantastic sea and city views. It is available partially furnished for both sale/ rent. Minimum rental period of 12 month upwards. Title deed is held in Foreign name. Building features 24 hour security, large communal pool and large reception area. A short walk away is the beautiful sandy Wongamat Beach with Pattayas shops, restaurants and nightlife all within easy reach.